Many of the world's city centres are grinding to a halt due to traffic congestion. 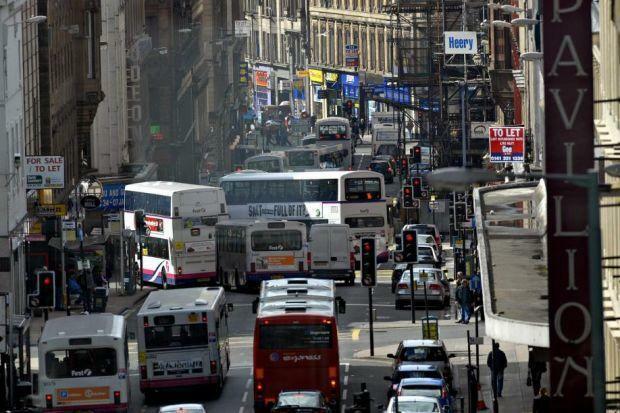 Pollution levels are climbing due to the effects of the internal combustion engine, and Glasgow has two of the most heavily polluted streets in Scotland on recent measures, with Hope Street and Dumbarton Road getting unwanted spots in a recent top ten list. 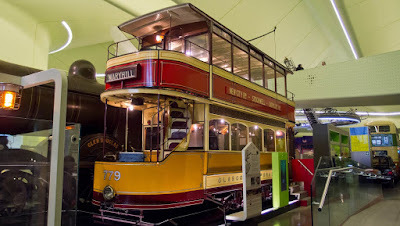 Improved public transport is often mooted as the best way forwards, so it seems a shame that whilst many cities have built urban tram systems and expanded their underground rail networks, modern Glasgow has a public transport system that seems to be a shadow of its former self. 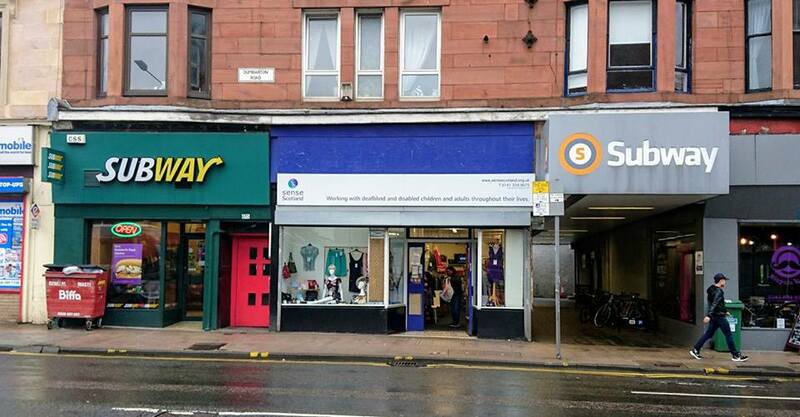 It was again suggested recently that there should be a serious look at expanding the Glasgow underground system. 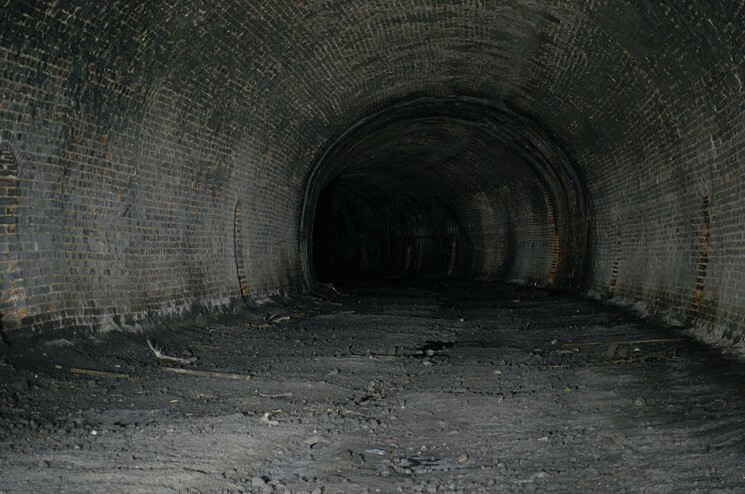 A network of old train tunnels still lies below the city streets, and are often talked about as potential routes for a new system. I have tried to have a look at what remains of the old rail infrastructure of Glasgow. 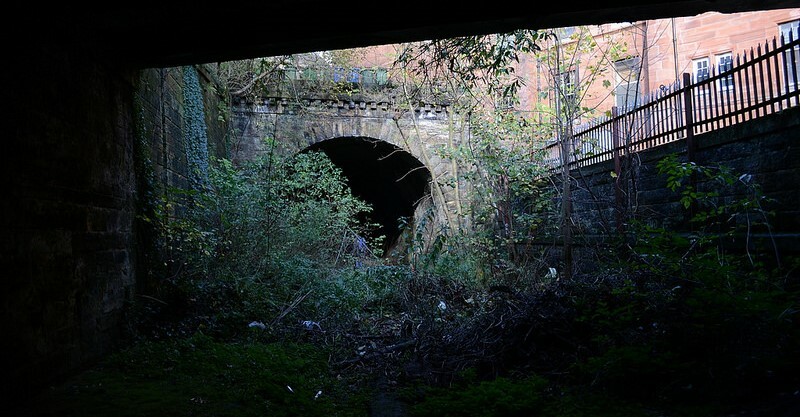 I know that there are many old railway cuttings and tunnels in the east end too, but this will focus on the pathways of the west end of Glasgow where I have grown up, and where I have noticed strange boarded up tunnels, cycle paths going over heavy duty iron bridges and several mysterious former platforms. My aim is to try and sort out in my head how this all used to join together. Subway - There are 157 cities around the world that can boast an underground rail or metro system. As the third city in the world to build one (after the London Underground and the Budapest Metro), the Glasgow's Subway, built in 1896, is one of the oldest in the world. However whilst the rest of the world kept building and expanding their networks, once we got to 15 stations serving the city centre, we stopped. Tram - Many cities in the north of England run efficient, modern tram systems. Edinburgh seems alone in managing to make a complete hash of installing one, which should not act as a deterrent to other cities' plans. Glasgow was ahead of the game here too, with over 100 miles of tram lines in the city by 1922, carrying over 1000 trams. By the 1960s it was decided that cars and diesel engined buses were the future and the last tram ran in the city in 1962. 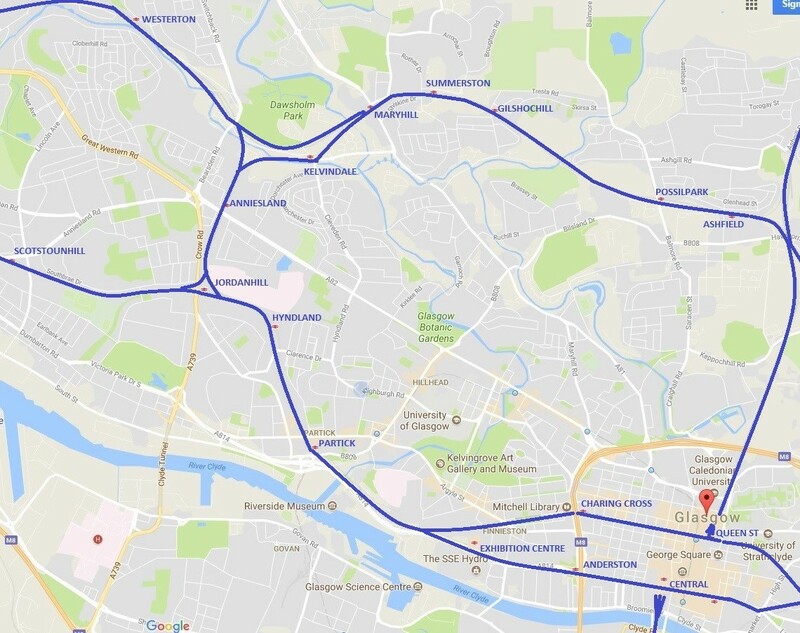 Proposals have been put forward to build a new tram-train link between Glasgow Airport and the city centre. 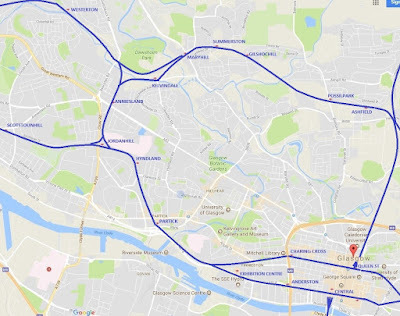 I would love to see it being a great success, as the other recent tram line proposals in Glasgow (between Maryhill and Easterhouse and along the Clydeside to the new Queen Elizabeth Hospital) have come to nothing. All that's left now of the old tram network are a few supports for overhead electrical cables on the side of tenements here and there and scraps of tracks in the odd un-tarmacked stretch of road. There is still a great affection for the old trams in Glasgow, although at present you need to go to the Riverside Museum to see them now, or to Summerlee Museum in Coatbridge if you want a short hurl in one. Bus - Ever since Margaret Thatcher de-regulated bus services they have been run by private companies for profit, rather than as part of an integrated transport scheme planned by local authorities. This can mean several companies competing for the profitable routes and local needs taking a back seat. Complaints of poor reliability, over-priced and over-crowded buses are common. As a major contributor to the pollution in city centres, new regulations are being brought forwards to force change upon the bus companies. What was once viewed as the modern transport solution is now part of the problem. The main effect of bus de-regulation was that across the country bus passenger numbers have fallen dramatically - except in London, where passenger numbers continue to climb, perhaps because de-regulation was blocked in London. Train - The first train lines in Glasgow were built to deliver coal to the growing city and its industries. 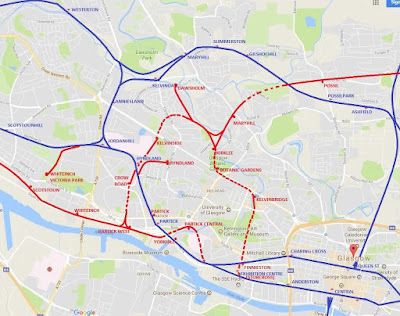 More train routes in Glasgow emerged as the city grew. 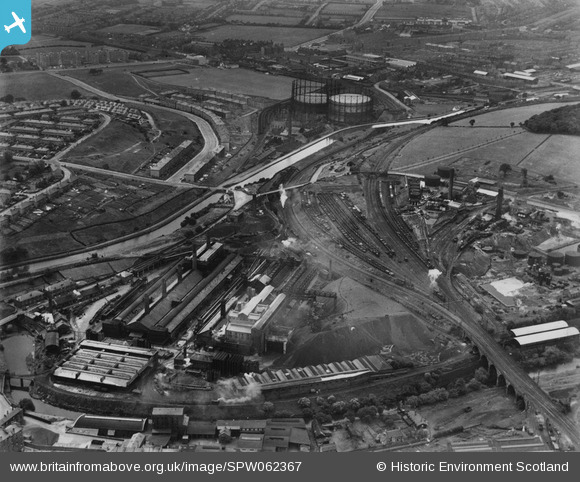 Much of this was fed by the growth of various industries, with passenger services and freight lines serving stations for eg Dawsholm Gasworks, iron works in Possil and Maryhill or the Clydeside shipyards. 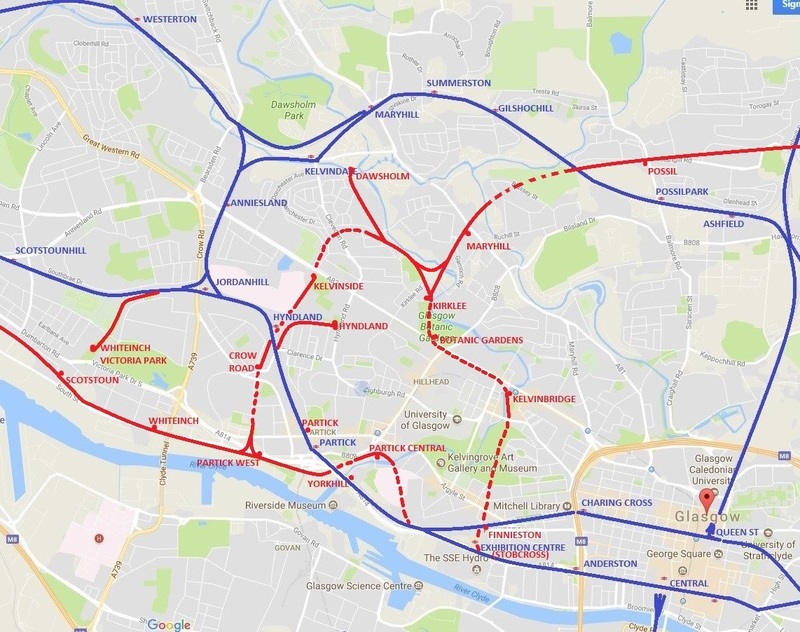 With competing companies often duplicating routes and with the rise and fall of various industries the number of lines and stations in Glasgow has gone up and down. The most dramatic fall was in the 1960s with the swingeing Beeching cuts to the rail network. In Glasgow this led to the closure of many lines and stations, including the large St Enoch and Buchanan Street stations. Since then several once closed old lines and stations in Glasgow have been re-opened and the idea of re-using some of the old underground tunnels has often been floated as a way to improve our transport links. However as time goes on, more of these lines are being built upon, making their re-appearance increasingly unlikely. Many of these old train lines are still empty, overgrown gap sites. Others are known to dog walkers, cyclists and joggers as quiet paths between the city streets. Having noticed disjointed hints of former rail lines all over the place, I hoped to spend a couple of days trying to see how much of this old infrastructure is still there, before it is all obliterated under huge blocks of student flats. 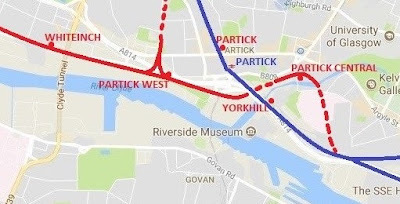 Firstly I would like to point out that I am no cartographer and these wee maps that I have drawn up are purely to give an indication where the old train lines are, they are not 100% precise. Also train lines, names and stations were opened/ closed/ changed over time so really there is no point in time that all the stations mentioned here were operating together as described by me. I will start at Kirklee Station as that was where I was a couple of weeks ago when I meandered down the line to see where it took me. Kirklee Station (also called Kirklee for North Kelvinside) was opened in 1896 and the line was run by the Caledonian Railway until the station closed in 1939. The line continued to run until 1964. 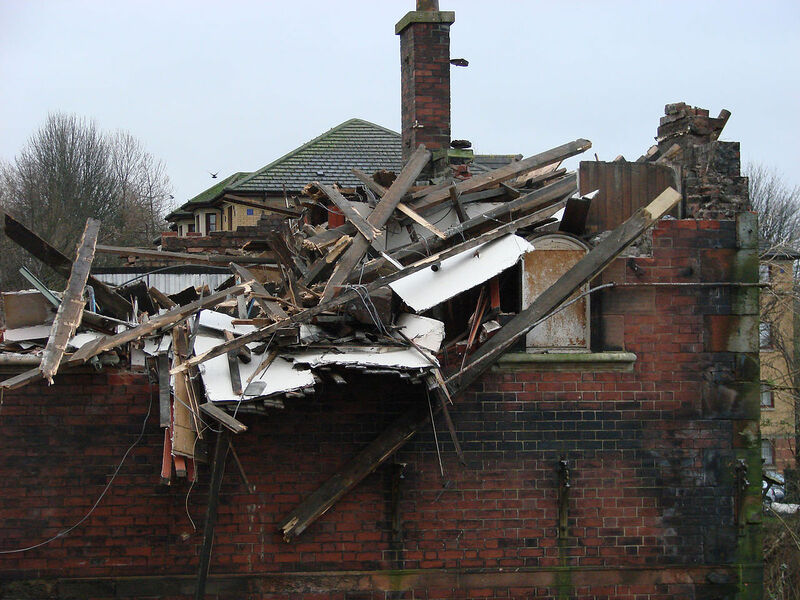 The red sandstone station building was demolished in 1971 and modern flats stand where it once was on the northern side of Ford Road. The station platform ran across a bridge into the Botanic Gardens where the platform can still be found. Looking down from among the shrubbery in the Botanics you can see the former train line enter a tunnel and the line then ran all the way under the Botanic Gardens. It then went underneath Great Western Road, briefly re-emerging into the open air at Kelvinbridge. As you walk along the tunnel the light you see up ahead is from the Botanic Gardens station. The station entrance was above ground on Great Western Road, with the platforms underground. As these were steam trains running along here there are large ventilation shafts overhead, from which you can peer down into the station from the park above. 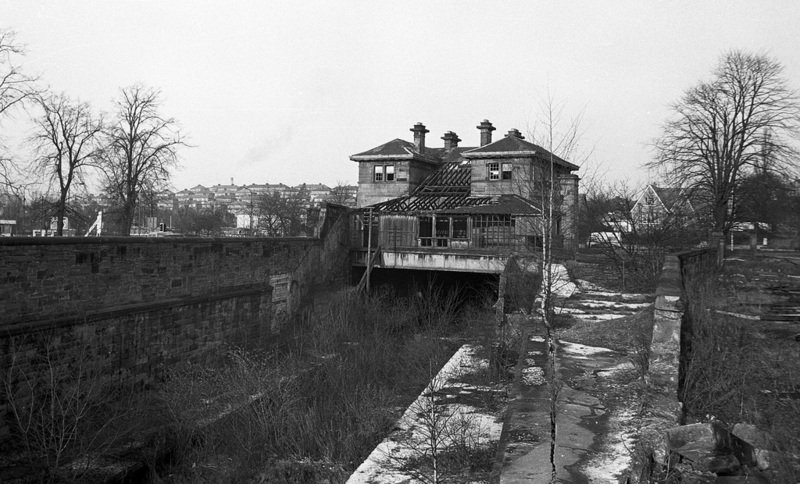 Botanic Gardens station was opened in 1896 and closed in February 1939, three months before nearby Kirklee Station. After the station closed the handsome station building on Great Western Road served many purposes, housing a plumber's shop, the Silver Slipper cafe that my mum frequented and Sgt. Peppers nightclub. In March 1970 fire badly damaged the building, and the decision was taken to demolish it. Leaving the Botanic Gardens the train tunnel continues underground along Great Western Road to Kelvinbridge station. A long tunnel eventually emerges into the open air behind the red sandstone "Caledonian Mansions" flats. Kelvinbridge station opened in 1896 and in 1901 was the main station used to take visitors to the Glasgow International Exhibition in Kelvingrove Park. The station continued for passenger services until 1952, and continued for freight until the line closed in 1964. The goods yard lay where the car park for Kelvinbridge subway station is now found. Four years after closing the handsome station building which stood up above Otago Lane was destroyed by fire. When Caledonian Railways bought the land to build the tunnel they also built the handsome flats on it up above which carry the company name and also on one wall, the "CR" company logo. After bending along the banks of the River Kelvin for a couple of hundred metres, the line then goes into a tunnel under Kelvingrove Park. In this 1969 picture workers clear the debris from the demolished station, into the river by the looks of things. 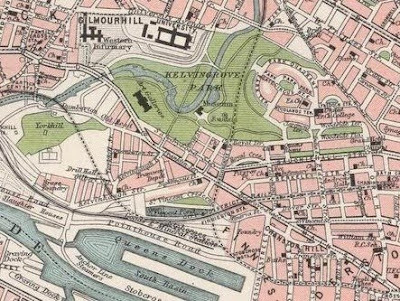 Note the path along the Kelvin in front of what is now Inn Deep bar does not yet exist. The tunnel underneath Kelvingrove Park is now soundly locked up but this tunnel and the one underneath Yorkhill were common venues for illegal raves in the 1990s. 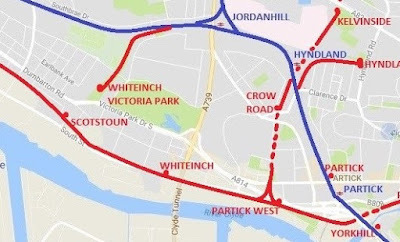 If you were to wander into it today, you would travel under the length of Kelvingrove Park and Kelvingrove Street and emerge south of St Vincent Crescent briefly. As you can see below the old Caledonian line you will have been following is here crossed by the live line between Partick and Charing Cross stations (the relative height of the two lines has changed over time) before it then enters another tunnel. To the south of here it used to join the line at the Stobcross Junction below ground, roughly where the current Exhibition Centre train station is today, on the Partick to Anderston/Central Station line. 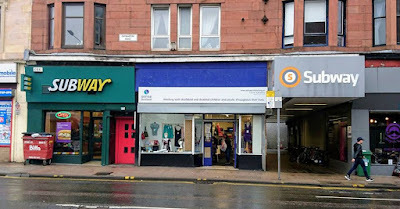 Partick was formerly served by three train stations, none of them on the site of the current Partick station on Merkland Street. 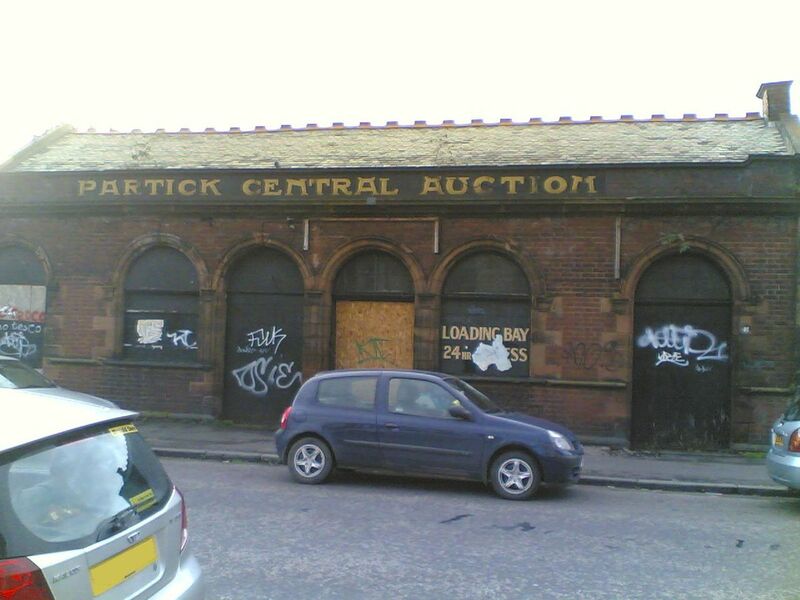 On a line that ran from Stobcross to Dumbarton serving the industries along the north bank of the Clyde such as Scotstoun, Yoker, Clydebank and Bowling, Partick Central railway station was built in the 1890s. In 1959 it was renamed Kelvin Hall station and passenger services stopped in 1964. The sidings still functioned for another 14 years serving the scrap merchant and oil depot on the site and the site was used by travelling people and a scrap merchant until recently. After Tesco lost their planning permission to build a superstore here massive blocks of student flats now fill the site and the former train cuttings have been obliterated. Interestingly archaeological surveys before the flats were built discovered that this was the former site of Partick Castle. 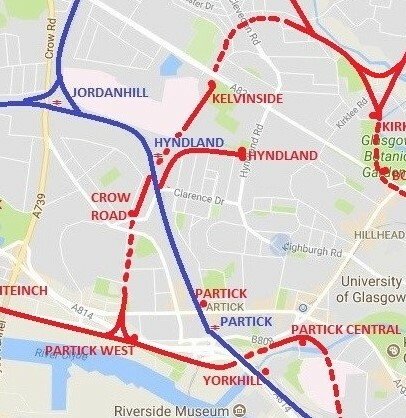 After leaving Partick Central station, trains heading east towards town would cross over the River Kelvin on a low bridge, and then into the opening of the Yorkhill Tunnel. The way in was previously visible at this point but a large block of student flats here on Old Dumbarton Road now seems to cover the entrance. The line would emerge south of Yorkhill below the Drill Hall on Gilbert Street. An overgrown bit of wasteland between Gilbert Street and Kelvinhaugh Street is all that remains of this short stretch, now back-filled. A hump in the road at Kelvinhaugh Street (below) shows you where the line then went underground again , shortly to join the current train line, roughly where it splits now towards Anderston or towards Charing Cross Stations. After passing under a tunnel at Merkland Street, the line west from Partick Central would soon come to Partick West station. Much of the line here was obliterated by the building of the Clydeside Expressway. Here the line split to head either west towards Dumbarton, or north up through what is now Thornwood Park. The area where the station was and the triangular train junction now lie underneath the new Partick Police Station. The line north has been developed into a park above Dumbarton Road and modern flats higher up the hill. The disused rail bridges here over Dumbarton Road were not removed until much later as I remember looking out the window of my aunt's flat on Dumbartron Road in the 1970s onto one of them. As the hill here climbs the train line entered a straight tunnel for about 100 yards, just north of Crathie Drive. 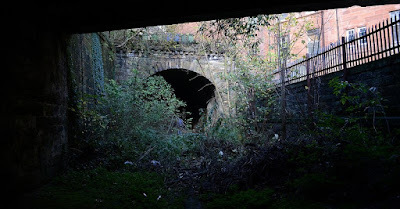 The tunnel goes underneath Cross Park and Crow Road and emerges briefly before going under Clarence Drive near Broomhill Cross. Under the road here Crow Road Station can be found. The station building would have been on Clarence Drive, opposite what is now a couple of garages. From Crow Road station the line followed an open cutting north, behind the houses on Chuchill Drive, until it went under another train line, close to where present day Hyndland station is found. Crow Road station was open from 1896 until November 1960, when it closed the day after the new Hyndland station was opened. North beyond Hyndland station the former line is no longer apparent below a complex of modern flats, until it reaches the former Kelvinside station, on Great Western Road beside Gartnavel General Hospital. The former station building here operates as the bar and restaurant 1051 GWR. Despite the extravagant building the station was being little used by the time of its closure in 1942, two decades before the line closed. The building has been damaged several times in the past by fire. The one I remember was in 1995 as I was working a night shift nearby when I heard an explosion in the middle of the night, not finding out until the next day that this was Carriages (as it was called then) going up in flames. The rear of the former Kelvinside station where the stairs would have gone down to the platform. Below the station the line entered the Balgray tunnel to head north towards Kirklee station and Maryhill. On a separate line from the one I've been following above lay the third Partick station, this one actually called Partick station (although it changed its name to Partickhill station in 1953). Opened in 1874 by the North British Railway Company on the north side of Dumbarton Road, trains from here ran north to either (old) Hyndland station or Jordanhill or Anniesland. When the Argyle line was re-opened in 1979 a new Partick train station was built above the Merkland Street subway entrance and Partickhill station closed. The station buildings stood until 1997. 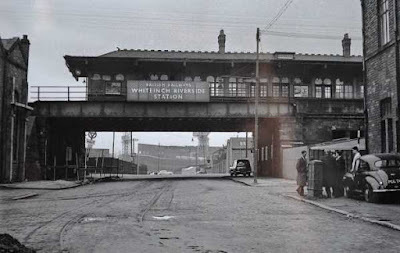 The entrance to the station can still be seen on Dumbarton Road, under the rail bridge, beside what was formerly Woolworths. Heading north a branch of the line curved east when it crossed Clarence Drive, and followed the bend of Hayburn Lane until it reached Hyndland Road. At the end of the line here was Hyndland station. 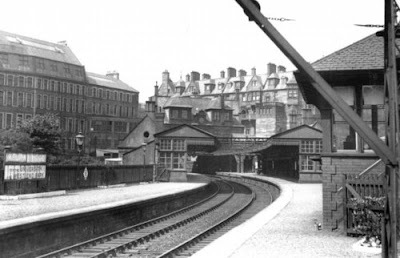 Opened in 1886 this was a busy station which continued to run until 1960 when the new Hyndland station opened. The station building was demolished in the late 1960s. The space here continued to serve as a depot for electric trains until 1989, and has recently been refurbished by local groups as "Old Station Park". Hayburn Lane, the line ran behind this wall. 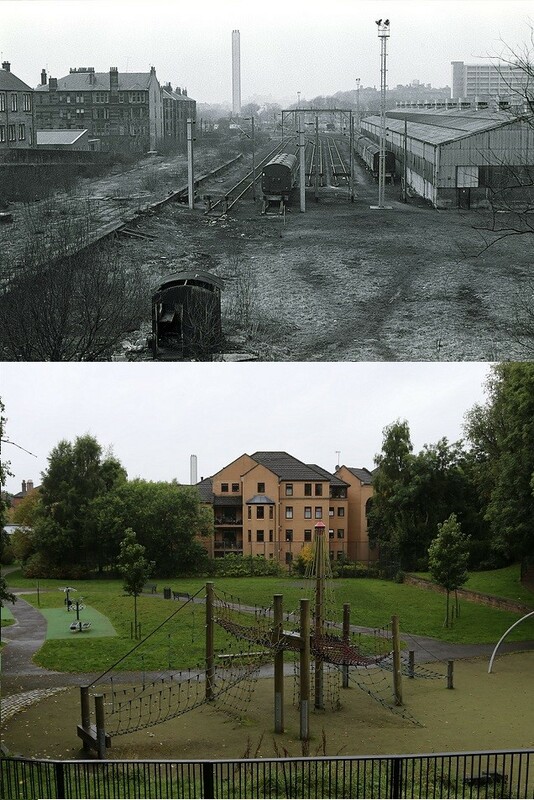 The Whiteinch Railway was built in 1874 as a goods line for the new industries developing in the area. 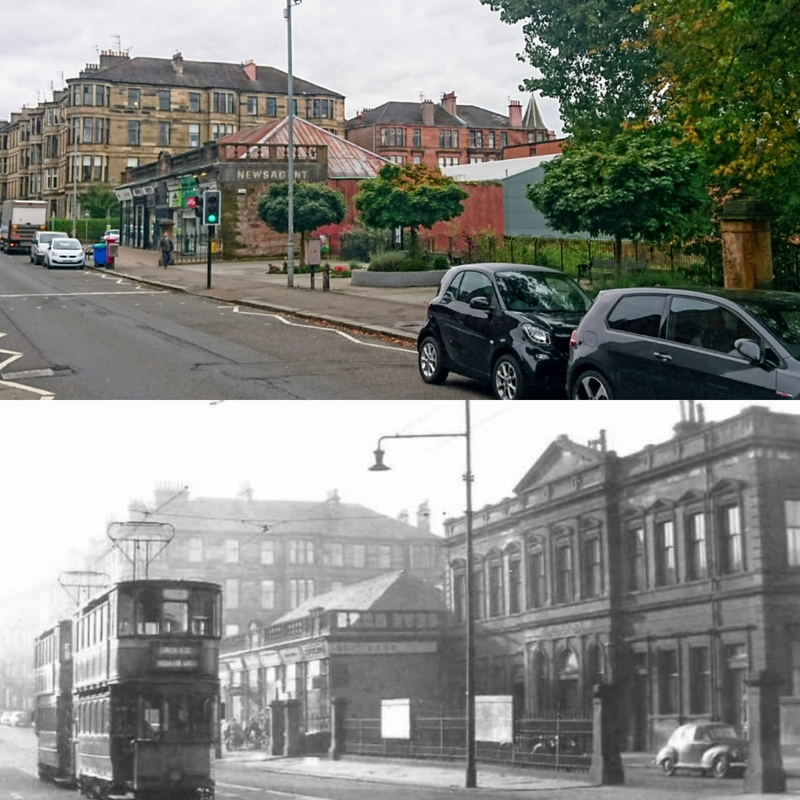 In 1897 the station was rebuilt as Whiteinch Victoria Park, to take passengers north, in a line paralell to Westland Drive to Jordanhill station. Entered at Dumbarton road, the station has now all gone underneath road redisign and a housing development west of Victoria Park bowling club. However you can follow the line north to where it joined the main line in Jordanhill, a path well known to dog walkers in the area. In 1951 the station closed but was used for another 16 years as a depot. The Caledonian Railway line that left Central station through Partick West would then head along the north bank of the Clyde towards Balloch and Dumbarton. It ran in an elevated position above South Street, easy to imagine as the route is now a cycle path and walkway. Other train sidings at street level served the shipyards, cattle byres and granary buildings on South Street. Opened in 1896 Whiteinch (later Whiteinch Riverside) was the first station you came to, which stood just where you join the cyclepath from South Street. The next station was Scotstoun East at the bottom of Scotstoun Street, where an impressive station building can still be seen below the bridge that carried the platform. Scotstoun West station is in Yoker, just where the line crosses Dumbarton Road on a bridge. It was a successful line carrying goods traffic and workers to the industry along here, but with the decline of these industries the traffic fell. With the nearby North British Railway line electrified, this line closed in 1964. At the end of the 19th century there were a lot of important industries at Dawsholm - textile printing works, a large corporation gasworks and associated chemical industries. The station at Dawsholm only served as a passenger station until 1908, but a six-road engine shed was built here which continued in use until 1964. On leaving Dawsholm the line immediately crossed the River Kelvin on a handsome bridge with many arches. 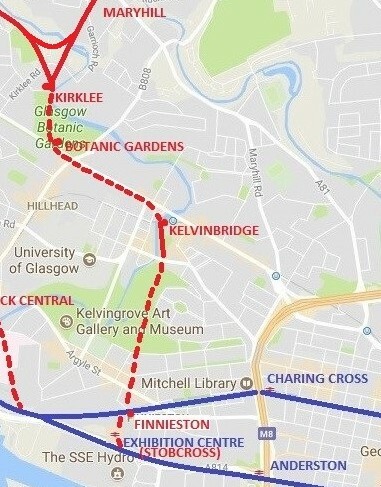 The line then splits to go right towards Kirklee station, or left, back over the River Kelvin towards Maryhill (later Maryhill Central) station. If you are walking along the Kelvin walkway behind the Wynford, you will see two bridges high above the river. These took the line from Maryhill Central station (now vanished below the Tesco superstore on Maryhill Road) sweeping right towards Dawsholm, or left, over the more substantial looking stone bridge) to Kirklee station. Over the bridges the lines converge and the cutting they took can be followed until it enters a bridge under Garrioch Road. On the other side of the bridge the line lies below the carpark of the Tesco superstore. Present day Maryhill station out near the Ram's Head pub, is on the site of the first station in Maryhill, opened in 1858. The Lanarkshire and Dumbarton line Maryhill station opened as Maryhill Barracks station, in 1894. The line was used by the local barracks to transport soldiers and their equipment. The name later changed to Maryhill station, then in 1952 this station became known as Maryhill Central. The station closed in 1964. When Maryhill shopping centre was built in the early 1980s a void was maintained in the basement to allow the line to be re-opened in the future. However, since 1999 the land along many sections of the line has now been sold for housing and there will not be trains running again along here anytime soon. The line then passes under Maryhill Road and can then be traced behind the Gala Bingo. The bingo hall was built just north of the line of the train track to allow it to be re-opened if required. The line lies below the car park and as it goes into a tunnel beneath the Forth and Clyde Canal behind the bingo and into Ruchill, you can only see the top of the tunnel entrance behind the shrubbery, the tunnel filled in with the raised road level. North of the canal the line goes into a tunnel before it emerged below Ruchill golf course and sweeps round towards Balmore Road. It goes through what is now a scrap yard (the site of the former station goods yard) and under the former Possil station building. This striking building is listed, but crumbling and neglected. The station opened in 1897, closing in 1908. It re-opened in 1934, and was called Possil North for 10 years before it closed in 1964. The "CR" of Caledonian Railways can be seen in the stonework of the station building. Okay, almost done now. Just to come around in a circle I will follow the line from Possil back down through Maryhill towards Kirklee station. Once over the River Kelvin the line passes between Kelvinside allotments and a complex of new flats called Kirklee Mansions. It passes underneath the block nearest to Kirklee Road and the iron balustrade of the rail bridge can be seen here on Kirklee Road. The tunnel under Kirklee Road has been filled in and the line can be followed down below a set of clothes line poles towards the flats that now cover the site of Kirklee station. 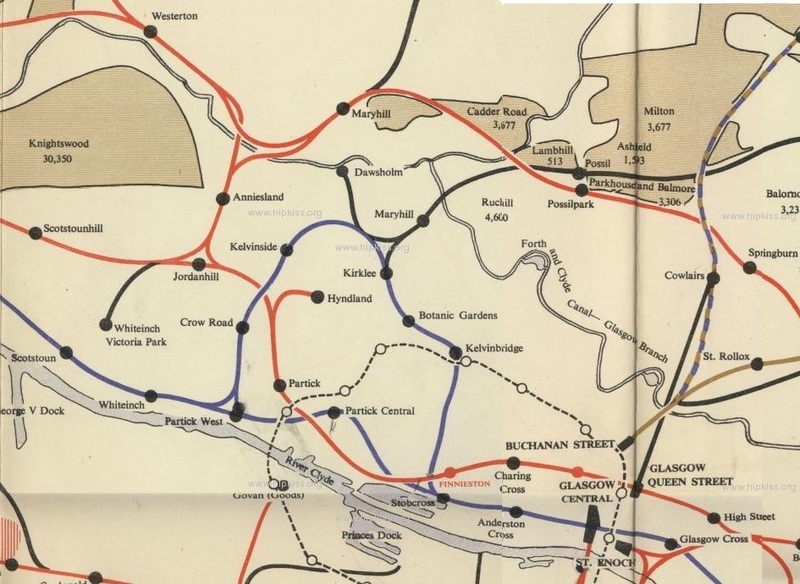 The rise and fall of these train networks followed the ups and downs of industry in Glasgow. The Beeching cuts of the 1960s set public transport on a wrong course, but were the consequence of many years of under-investment in the transport infrastructure. The remaining industrial architecture gives wee hints at the skilled craftsmen who lived in Glasgow and built these metal railings, stone bridges and dug the tunnels. I would love to see a modern light railway or tram system built in Glasgow, to take some of the buses and cars off the roads that are grinding to a halt, but I won't hold my breathe. If it is built, it will never be on the scale of what was here 100 years ago. This is fascinating - I’m very familiar with much of this area and aware of the old lines criss-crossing it but, other than peering down the shafts at the Botanics, haven’t explored anything that’s not in plain view. Some of that plain view is out of my own back window - I confess my house is one of the ones built over a line that can never re-open! An excellent piece of research. Very well done, Answers a lot of questions! There must be some scope to use at least some of the tunnels to improve Glasgow's public transport network should the day ever come when common sense breaks out. Excellent piece of work, discovered while looking for info on Dawsholm shed. Never knew there was a passenger station and still wonder why it was built. It's funny how language changes though. You refer to train line or train station throughout. To me they were always railway lines and railway stations. Still can't get used to the change ! Great work all the same. I remember the (recently closed at the time) Crow Road station at the end of Randolph Road where I lived as a kid. That would have been about 1969. It was pretty quickly vandalised. My best pal and I would throw bangers down the embankment where they would echo among the old buildings. We also took the walk through the tunnels in either direction. The new houses built on the old station site are now Clarence Gardens. There was also an old Coal Depot on the east side of Clarence Drive. In the vicinity of what is now the Royal Mail facility. Logic (and the curve in the footprint of the buildings) would suggest if must have been served off a spur from the present line running between the present Hyndland and Partick Stations. Though it doesn't show on your map at the top of the page. The old Hyndland Station at Hyndland Road (now the playpark below "Carriages") in the 1960-70's was a four bay shed for the "Blue Trains" when I was a kid. You could go up the line and staying carefully to the side look at them sitting - often still partly powered up with their compressors churning away keeping the air brake bottles topped off. No one ever seemed to be about (or could be bothered to chase us away!). The triangular interchange at Jordanhill was at the far end of Randolph Road and could be easily accessed by following the path past the Scout Hut (I think they were the 9th Glasgow Scout Pack) and onto the lines behind Churchill Drive. You had to be a bit more careful here because you were never quite sure which way the trains were going to be moving because it was an interchange. This was a great spot to put a penny on the line, wait it out in the bushes till the train had passed and then go and collect the remains of your penny - flattened out to a thin pancake. A spur to Partick Goods yard started here. A line joined the southbound track in the station - it ran north from here and parallel to the Stobcross Railway. The north end of this was a reversing spur - it ended with a buffer. TRains would then run parallel to the Stobcross Railway to reach the Caledonian Railway's Partick goods depot. This depot was originally reached from the Stobcross Railway and to which the Caledonian Railway had access rights in to stop the North British Railway having a monopoly to the lines to the Queens Dock. The North Yorkshire Moors Railway Shed is a popular tourist attraction in the area. The steam train links the inland town of Pickering to the very small village of Grossmont, near the Whitby coast. And in recent years the train journey has been extended to allow some services to run the full journey through to Whitby. Yes - excellent review. Very interesting and informative. Thanks! Glasgowpunter, your descriptive journeys of the once grand west of Glasgow suburban lines bring back fond memories. As a youngster I lived in Essex Drive and in the early 1970’s, my parents used to suggest that myself and my younger brother ‘disappear and don’t come back until tea time’ on Saturday afternoons. 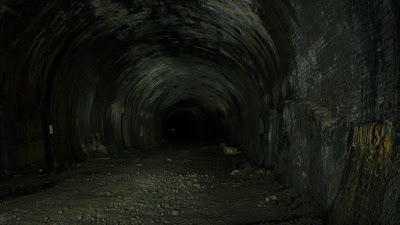 It was a wonderful adventure, exploring the disused tunnels which in these days had not been fenced up and you could walk freely with homemade torches of burning tar on a stick. I walked through all the tunnels you describe, they were truly adventurous days.